Ratna Lingpa (Tib. རཏྣ་གླིང་པ་, Wyl. rat+na gling pa) (1403-1478) — a Tibetan tertön, who compiled the Nyingma Gyübum, Collected Tantras of the Nyingmapas in the fifteenth century. 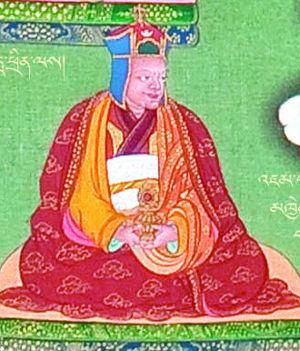 He is also known by the names of Shikpo Lingpa (ཞིག་པོ་གླིང་པ་, zhig po gling pa) and Drodul Lingpa (འགྲོ་འདུལ་གླིང་པ་, 'gro 'dul gling pa), because during his single lifetime he revealed the destined termas of three different lifetimes. This page was last edited on 13 September 2017, at 09:33.